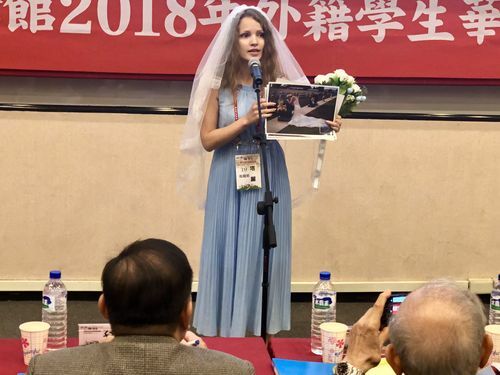 Taipei, Nov. 6 (CNA) An undergraduate student from Peru took first place Tuesday in a Mandarin Chinese public speaking contest for foreign students in Taiwan. Francisco Javier Najar Ramal, aged 29 and a senior at the Department of East Asian Studies at National Taiwan Normal University (NTNU), won for speaking about his weight-loss experience, in which he started off by showing the audience an old shirt that he wore when used to weigh 106 kilograms a decade ago. 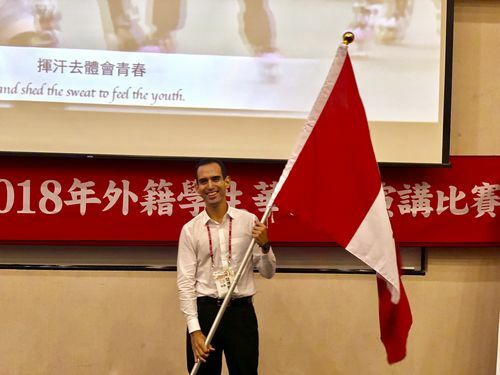 Najar Ramal, who hails from the Peruvian capital of Lima, told CNA that he first started learning Chinese at a non-profit public educational organization in that city before spending a year in Shanghai. After returning to his country, he finished his studies in engineering and then decided to come to Taiwan to study Chinese at a "deeper level," Najar Ramal said, adding that he has studied the language very hard because his classes are taught in Chinese. 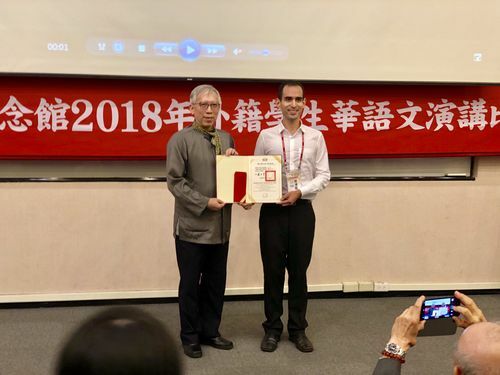 Explaining his motivation behind studying Chinese, Najar Ramal, who was awarded a cash prize of NT$10,000 (US$325), replied that "it's because I really love Chinese culture, I really really like the Chinese language." "Learning a language, especially Chinese is a journey that never ends and I will be very happy if I can keep on studying, following this path until the end of my life (as) this is what I love," he said. He added that he hopes to continue his studies because one of his dreams is to become a sinologist or maybe a translator and interpreter. 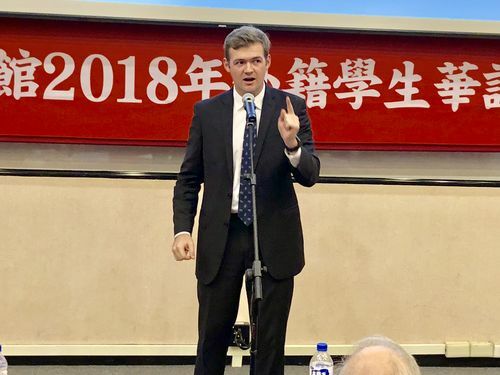 Expecting to graduate in June, next year, he credits his instructor at NTNU's Mandarin Training Center, Chang Tai-chi (張黛琪), for Tuesday's first prize win by helping him to develop a special rhythmic pattern. 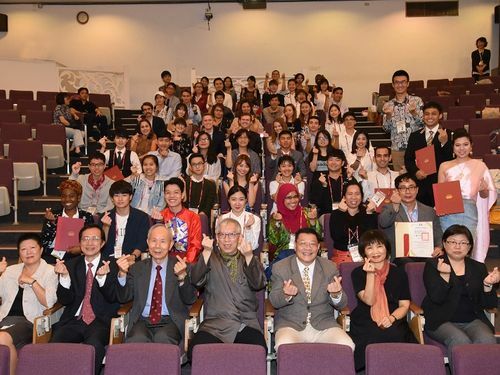 The contest was organized by the National Dr. Sun Yat-sen Memorial Hall to promote Chinese-language learning, Taiwan's culture and the thoughts and ideas of Sun, the founding father of the Republic of China, which is the formal name used by Taiwan. The 60 contestants from 14 countries combined fluent Mandarin-speaking, lively body language and a sense of humor in their speeches. Some sang, while some brought props to help interact with the audience during their presentations. 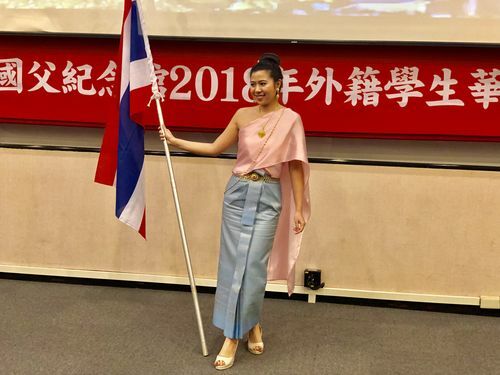 Thai student Siriruk Saengchanchai, who introduced her father's pattern of loud snores every night and her job as a journalist covering major news events, finished second and won NT$8,000. 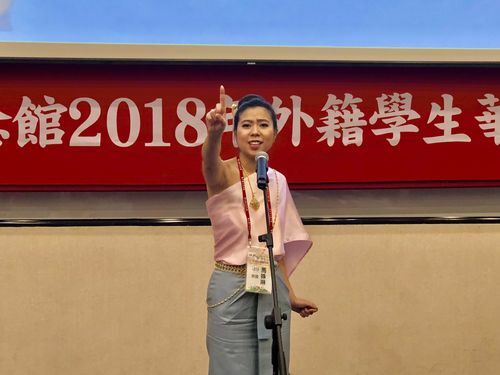 Saengchanchai, who has studied Chinese for two years, came to Taiwan on a scholarship program to study at National Chengchi University's International Master of Business Administration program, but said she has been exposed to Chinese since she was young. She said she learned basic Chinese before but as she grew older, she wanted to become an expert in Chinese. She described the competition as a good indicator of how her studies are progressing. Nataliia Sharypova of Russia and Carson Michael Mulligan of the United States won third and fourth places, respectively, while 12 other contestants received merit awards.